I aim to give my patients the best professional treatment in a relaxed, caring environment. We boast of the best veterinary facilities in the city at our clinic. I believe in regularly upgrading my skills by attending international seminars and training programmes so that I can bring the best quality care to my patients. Dr. Freya Javeri is an experienced Veterinarian practicing in Thaltej-Shilaj road, Ahmedabad. She has been a practicing Veterinarian for 15 years. Apart from her private practice she is also an expert consultant for Zydus Research Centre's Canine Research facility. After graduating as a veterinarian, she completed her Masters in Small Animal Clinical studies (MVS) from the University of Melbourne, Australia. 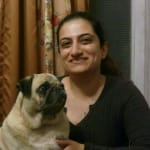 You can consult Dr. Freya Javeri at Dr. Chirag Dave's Pets' Clinic, Thaltej-Shilaj Road, Ahmedabad. Book an appointment online with Dr. Freya Javeri on Lybrate.com. Sir my dog is suffering from itching I had given him avil 50 mg medicine, tactic lotion 25 ml, fluka, furglow But still there is a problem of itching and redness of skin m so worried please suggest some medicine that make him free of all these .he got pus (sinuses) on his back do us help his bladder and leg area get reddish. suggest some effective medicine that give him relief. You will need to visit a veterinarian for complete diagnostics to find the cause of infection and itching since Avil alone doesn't seem to be helping. There are many causes of such conditions in dogs including allergies, various ectoparasites, atopy, etc. I have 3 year old female Indian dog. She has problem getting up after sitting and has been walking slower than her usual pace. Vet here gave nurokind pet syrup, calcium supplement and bone builder. Yet I don't see any improvement. It has been three days since this started. Please suggest something. Start her on pain medication and joint supplement. You can give Pet Cam syrup - it has a measuring syringe marked according to the dog's body weight- give once a day upto the appropriate bodyweight mark. Also she will need joint supplements added to her food like Maxima or Megaflex powder 1 scoop daily. If she's not better in a week's time it may be necessary to get xrays and further diagnostic tests done. Sir I have a golden retriever puppy of 30 days old nw it has fleas on it nw I afraid weather they will be gone by anti fleas powder or they will not. Notix/Bolfo powder is the only compound safe enough to use on such a young puppy. When using that remember to brush out the coat after application. Also, since he has fleas, he must also be dewormed with a puppy dewormer.